A U.S. congressman says the bomb used in the deadly Manchester Arena attack in England suggests a "level of sophistication" that might indicate its maker had foreign training. Texas Republican Mike McCaul, chairman of the House Homeland Security Committee, told The Associated Press on Wednesday that the bomb that killed 22 people and the alleged attacker was "a classic explosive device used by terrorists." McCaul said the device used the explosive TATP, the same one used in the deadly November 2015 attacks in Paris and the March 2016 attack in Brussels carried out by Islamic State extremists. McCaul was due to get an intelligence briefing on the Manchester attack later Wednesday. He says the evidence so far suggests "we're not dealing with a lone wolf situation." Echoing the comments of British officials, he said: "There's a network — a cell of ISIS-inspired terrorists." British police have arrested a seventh person in connection with the Manchester Arena bombing. 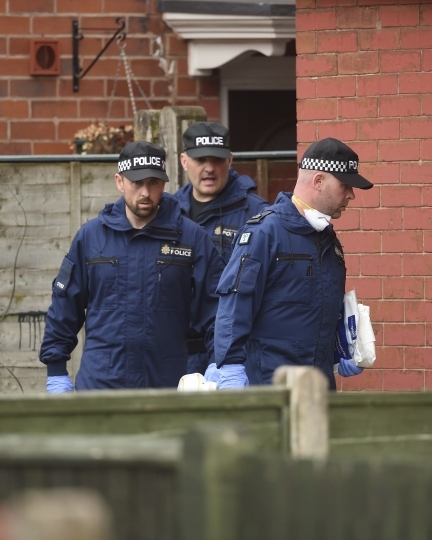 The man was held Wednesday after police carried out searches in the English town of Nuneaton, which is about 161 kilometers (100 miles) south of Manchester. 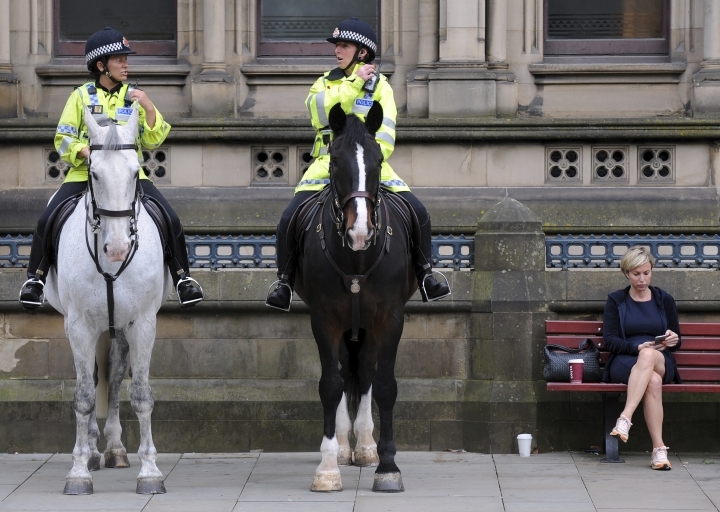 His arrest was the first in England to take place outside of Manchester since the bombing. 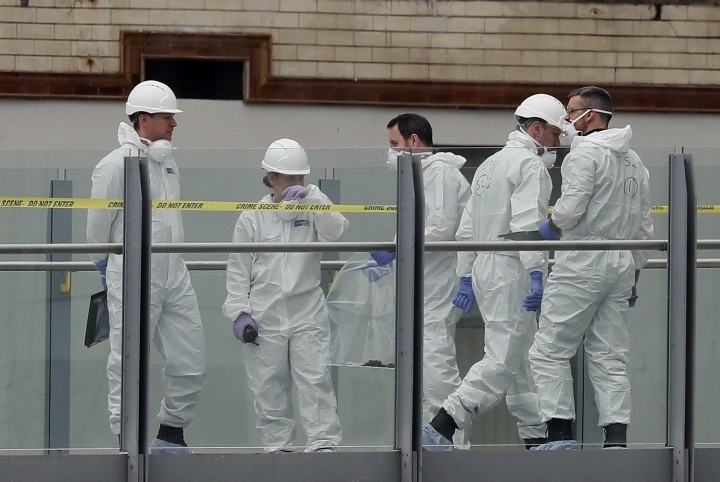 Greater Manchester Police says six men and one woman remain in custody as the department investigates the Monday night bombing that killed 22 people. The attack took place at the end of a concert by American singer Ariana Grande. A British broadcaster has obtained security camera footage that it says police believe shows the suspect in the Manchester Arena bombing wearing a backpack that was used in the attack. Sky News on Wednesday aired two screengrabs of a man walking in Manchester's Arndale shopping center on Friday night carrying a blue backpack with a sales tag still hanging off of it. 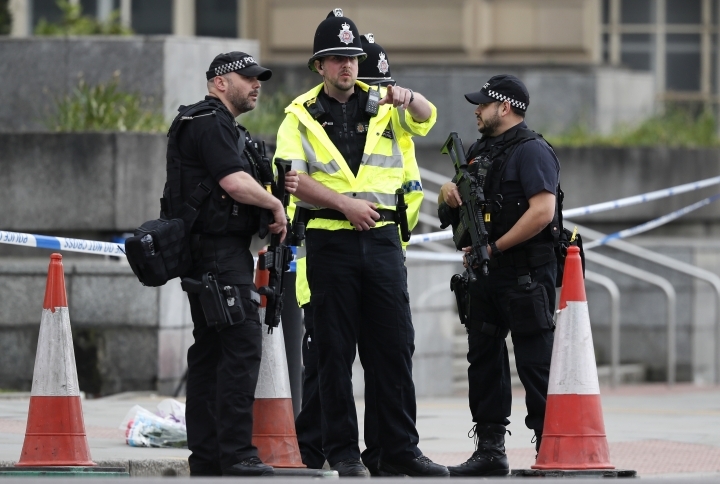 But the broadcaster reported that police think the man is alleged bomber Salman Albedi and the backpack played a role in Monday's attack after an Ariana Grande concert. Twenty-two people were killed in the attack. Police say Albedi also died. Police in Manchester say a woman has been arrested in connection with the arena bombing that killed 22 people. Greater Manchester Police said the woman was detained during a series of property searches in the Blackley area of the city. 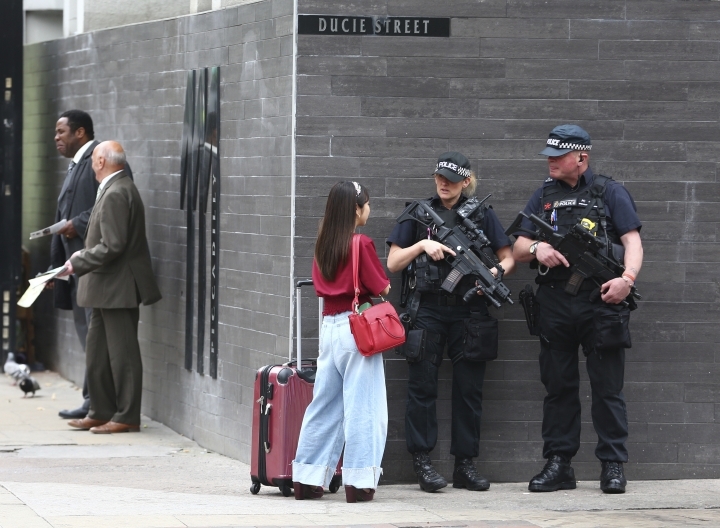 The unidentified woman is the sixth person who has been arrested in England since Monday's bombing after a concert by American pop singer Ariana Grande. One of them is the older brother of the alleged bomber, Salman Abedi. Abedi's father and younger brother also have been detained in Libya. The Manchester police said in a statement: "This is a fast-moving investigation and we are keeping an open mind at this stage." Ariana Grande's management team says she has suspended her world tour through June 5 in the wake of the deadly bombing at her concert in Manchester, England. Grande has kept a low profile since Monday's Manchester Arena blast, which killed 22 people. She took to Twitter afterward to say she was "broken" and "i don't have words." A Libyan anti-terror force that arrested the brother of the alleged Manchester bomber says he had links to the Islamic State extremist group and was aware of his brother's plans. The Special Deterrent anti-terror force said in a statement on its Facebook page that the arrest took place in Tripoli as Hashim Abedi was receiving cash transferred from his brother, Salman. British authorities have identified 22-year-old Salman Abedi as the suspected bomber in the attack at Manchester arena on Monday night. The force's statement says: "The brother was aware of all the details of the terrorist attack." The Libyan security force claimed that Hashim Abedi told authorities that both he and his brother belonged to IS. The Facebook statement says Hashim left Britain for Libya in April. The British government says a national minute of silence will be observed on Thursday to remember those who died or were affected by Monday's bombing at a Manchester arena. The silence will take place at 11 a.m. local time on Thursday. Officials also said that flags will remain at half-mast on government buildings until Thursday evening. 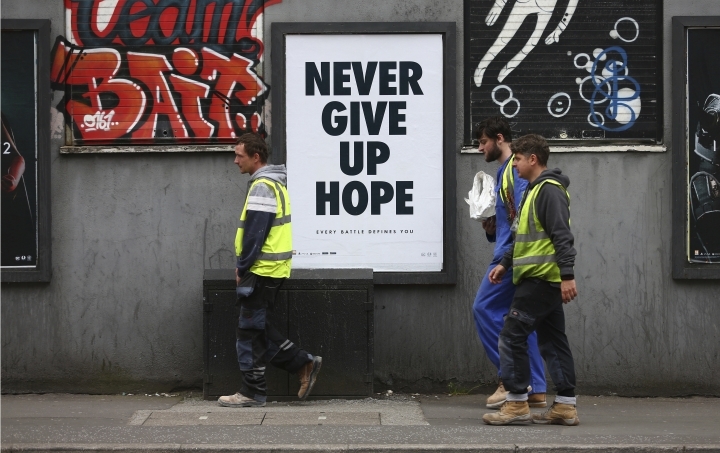 Britain's political parties say they plan to resume campaigning Friday for the June 8 general election after putting campaign events on hold to show respect to bombing victims. The bombing suspect's father and two of his brothers have been arrested in England and Libya in connection with the attack, which killed 22 and injured dozens others. The spokesman for a Libyan anti-terror force says the father of the alleged Manchester bomber has been arrested in Tripoli. Bin Salem says the elder Abedi was detained for interrogations. Before his arrest, the father told the AP that his son was innocent and had been planning a trip to Saudi Arabia for a pilgrimage. Ramadan Abedi also had said he worked as the administrative manager of the Central Security force in Tripoli. He said he fled Tripoli in 1993 after Moammar Gadhafi's security authorities issued an arrest warrant and eventually sought political asylum in Britain. Salman Abedi was born in Britain in died in Monday's attack at Manchester Arena. Two of his brothers have been arrested along with their father. 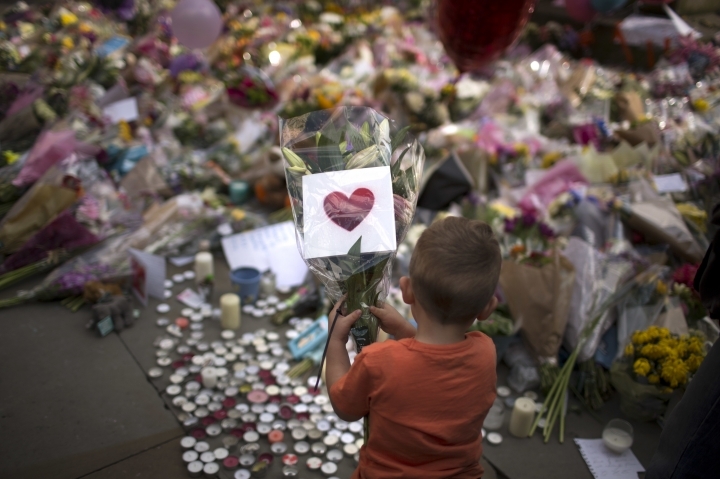 Scores of people have gathered in a Manchester square for a multi-faith vigil for the victims of Monday night's bomb attack at an Ariana Grande concert. 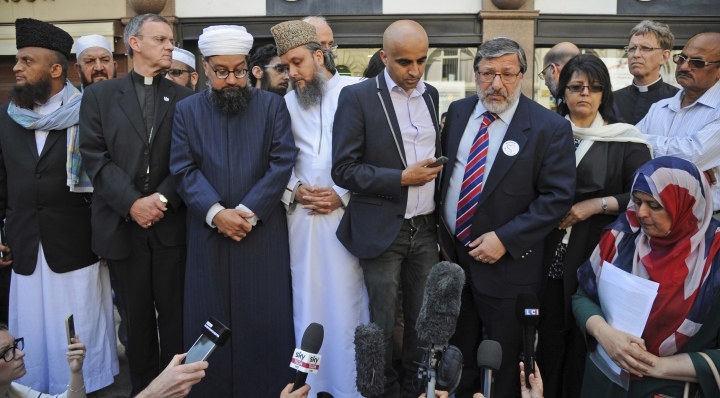 Leaders from Manchester's Muslim, Christian and Jewish communities echoed the message that extremists would not drive a wedge between the city's religious groups. Irfan Chishti, the imam of Manchester's biggest mosque, told the crowd, "There are no divisions here tonight." The Catholic bishop for the area, John Arnold, read a message from Pope Francis. Arnold said the pontiff offered "his assurance of his prayers for the injured and for all who have died." A Libyan security spokesman says another brother of the alleged Manchester bomber has been arrested, this one in Tripoli. Ahmed bin Salem, the spokesman of a Libyan anti-terror force, says a younger brother of Salman Abedi, Hashim, was detained on Tuesday. Bin Salem gave no further details. 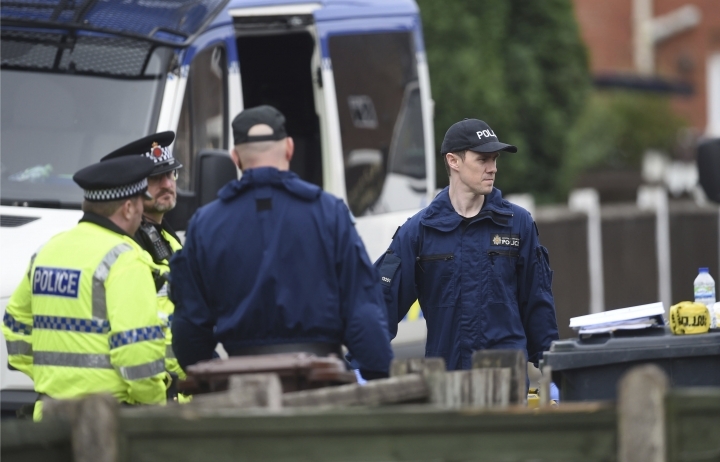 The alleged bomber's father, Ramadan Abedi, told The Associated Press on Wednesday, that another son, Ismail, was arrested in England on Tuesday. The 22-year-old Abedi is a British citizen born to Libyan parents and grew up around Manchester. He died in the attack. The bombing killed 22 people and wounded scores at an Ariana Grande concert Monday night in Manchester. British police say officers investigating the Manchester Arena concert blast have arrested a fifth suspect, and are assessing a package the suspect was carrying. 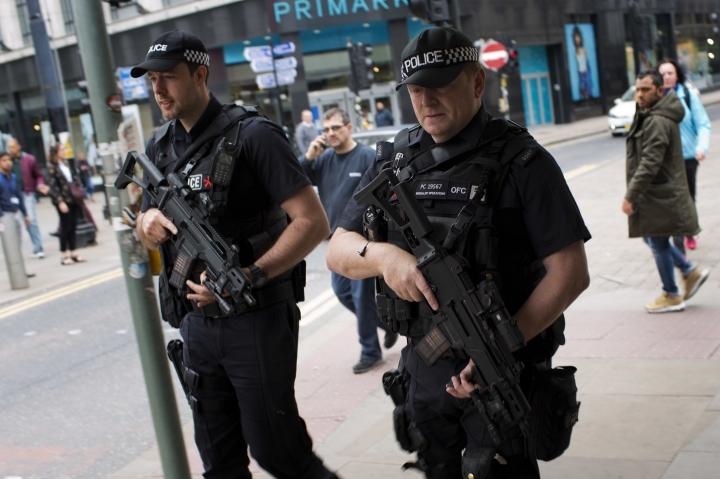 Greater Manchester Police said the suspect was detained in Wigan, a town to the west of Manchester. The force did not immediately provide details. 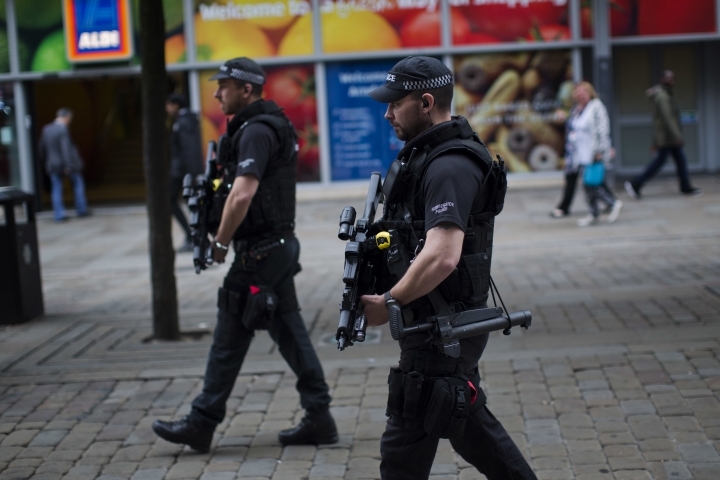 Officers also arrested three men earlier Wednesday in Manchester, where a bomber attacked an Ariana Grande concert, killing 22 and injuring dozens others. Another man, the brother of alleged bomber Salman Abedi, was arrested on Tuesday. A spokesman for the Manchester Islamic Center has denied reports that the man identified as the bomber who attacked a pop concert in the city worked at the center. Officials identified the bomber as 22-year-old Salman Abedi, a British citizen born to Libyan parents. Islamic Center spokesman Fawzi Haffar told reporters on Wednesday: "This bomber has never worked in this center." Haffar also told reporters he was concerned about reports of "anti-Muslim acts" the center has received since Monday's attack. 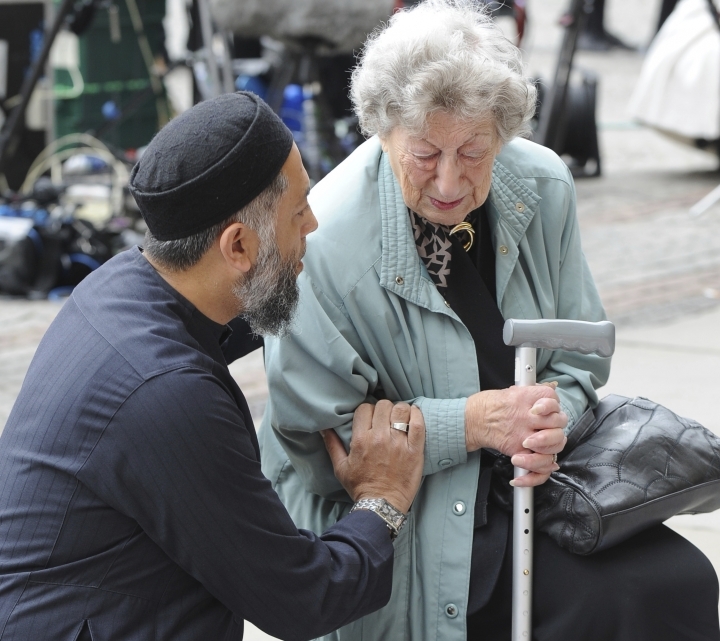 He says the reports range from verbal abuse to damage to mosques in Manchester and elsewhere. The attack at Manchester Arena killed 22 people, including children and many teenagers. Manchester's police chief has told reporters that it is clear "this is a network we are investigating" as he gave an update on the probe into the bomb attack at a pop concert in the city. His comments followed media reports that the alleged bomber, Salman Abedi, acted as a "mule" for others. He confirmed that a total of four suspects have been detained so far. Witnesses say they heard explosions as police raided a block of flats in central Manchester following Monday's attack. Manchester Police said officers briefly closed a railway line on Wednesday to carry out a search as part of the investigation into the deadly bombing at the Ariana Grande concert Monday. 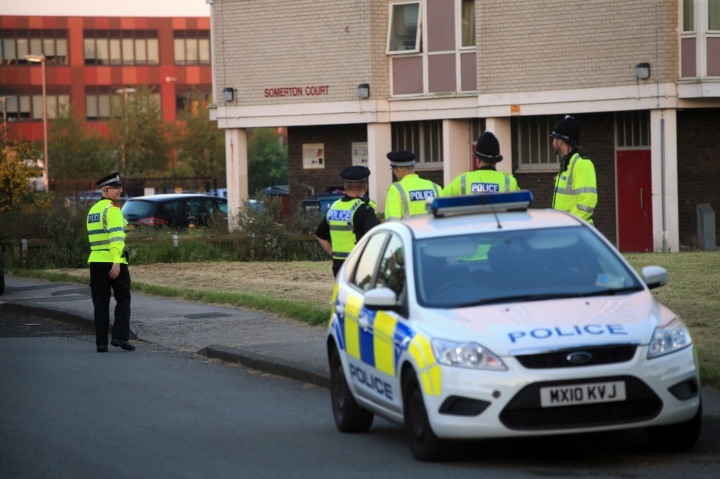 Residents described how armed police and men clad in balaclavas stormed the Granby House building, an apartment block where rented apartments are popular with students and young professionals. Muye Li, a 23-year-old student who lives on the third floor, says he heard an explosion as police stormed an apartment on his floor. He says officers knocked on his door and "asked me if I had seen the lady next door," and believed police were looking for a woman. A former Libyan security official says the father of the alleged Manchester arena bomber was allegedly member of a former al-Qaida-backed group in Libya. 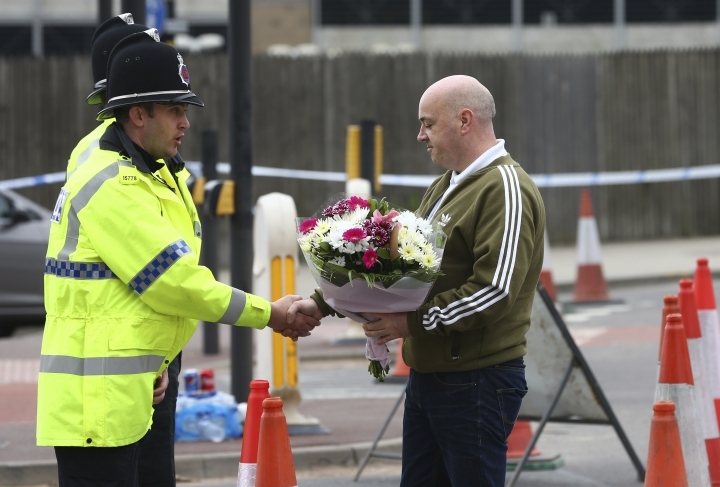 Former Libyan security official Abdel-Basit Haroun said Wednesday he personally knew Ramadan Abedi, the father of Salman Abedi, and that the elder Abedi was a member of the Libyan Islamic Fighting group in the 1990s. The group had links to al-Qaida. Although the LIFG disbanded, Haroun says the father belongs to the Salafi Jihadi movement, the most extreme sect of Salafism and from which al-Qaida and the Islamic State group hail. Haroun says Abedi, also known as Abu Ismail, had returned to the Libyan capital of Tripoli. 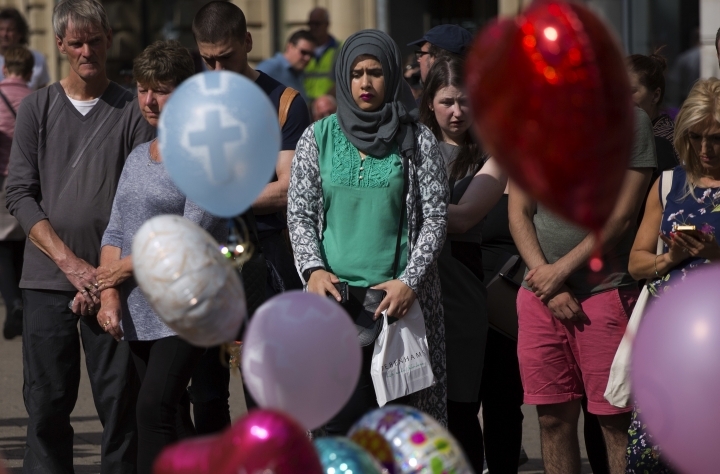 Ramadan Abedi told The Associated Press in a telephone interview from Tripoli that his family "aren't the ones who blow up ourselves among innocents." The father of the alleged Manchester arena attacker denies his son is linked to militants or the suicide bombing that killed 22 people. Ramadan Abedi says he spoke to his 22-year-old son, Salman Abedi, five days ago and he was getting ready to visit Saudi Arabia and sounded "normal." He said that his son visited Libya a month-and-a -half ago. The elder Abedi told The Associated Press by telephone from Tripoli: "We don't believe in killing innocents. This is not us." He said his other son, Ismail, was arrested in England on Tuesday morning. He said Salman was planning to head from Saudi Arabia to Libya to spend the holy month of Ramadan with family. Abedi fled Tripoli in 1993 after Moammar Gadhafi's security authorities issued an arrest warrant and eventually sought political asylum in Britain. Now, he is the administrative manager of the Central Security force in Tripoli. Manchester United fans are congregating in Stockholm's city center, dominating bars and singing songs ahead of their team's match against Ajax in the Europa League. A flag outside a bar in the Swedish capital displayed the words: "United against terrorism. Lest we forget 22.05.17" — the date of Monday's suicide bombing in the English city of Manchester. The final will kick off at Friends Arena on Wednesday, less than 48 hours after a deadly bomb attack at a pop concert in Manchester killed 22 people. There will be a huge security presence at the venue. A police helicopter was flying above the city center Wednesday afternoon. Premier League champion Chelsea has called off its victory parade because of the concert attack in Manchester. Chelsea says it would be inappropriate to hold a parade in London this weekend following Monday's bombing at a concert in Manchester and adds "we are sure our fans will understand this decision." The club says "given the heightened security threat announced by the government, and recognizing that this is a developing situation, we have given this careful consideration." Chelsea also says it does not want to divert emergency services. English soccer champions traditionally celebrate by driving through the city streets on an open top bus, with players holding trophies and waving to fans. 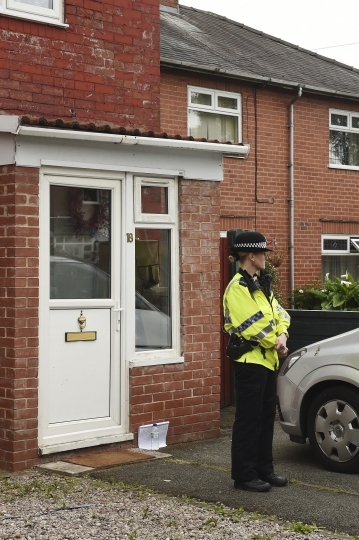 Manchester police made an arrest early Wednesday at a house just a 10-minute walk from the home of suicide bomber Salman Abedi. Omar Alfa Khuri, who lives across the street, said he was awakened at 2:30 a.m. by a loud noise and saw police take away the father of the family that lives there in handcuffs. He said the man is named Adel and is in his 40s, with a wife and several children. He says "there was a policeman, armed policeman, shouting at my neighbor ... and I realized there is something wrong here ... they arrested the father, and I think the rest of the family kind of disappeared." He said he immediately suspected the arrest might be linked to Monday night's concert bombing. He said he knew the man from the neighborhood and the mosque. He says "in the last 15 years, I haven't seen him in trouble at all. I haven't seen police come to his house." British police say they are now confident they know the identities of all the people who lost their lives in Monday's concert attack in Manchester. But Greater Manchester Police said Wednesday that it could not formally name the victims until forensic post-mortems are concluded. 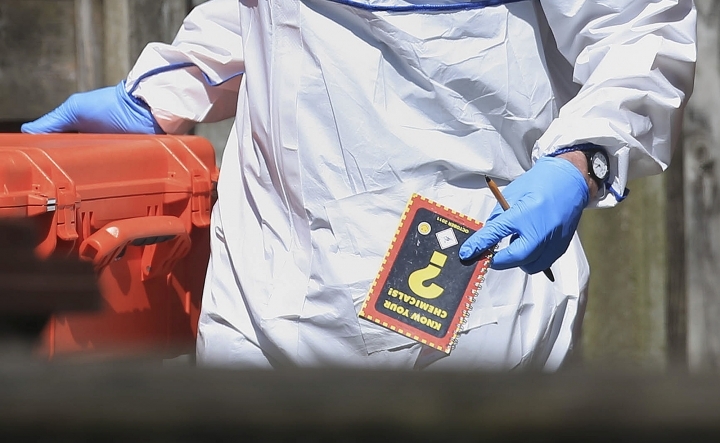 The force said because of the number of victims, that is likely to take four to five days. It said all the families affected have been contacted and trained officers are supporting them. Officials said 22 people were killed in the suicide bombing of an Ariana Grande concert at Manchester Arena, including teenagers and children. Some of them have been named by friends and family. The youngest victim was 8-year-old Saffie Roussos. A school near Manchester says it is "in shock" and heartbroken as it announced that one of its students, teenager Olivia Campbell-Hardy, was killed in the Manchester concert attack. Tottington High School, in Bury near the city of Manchester, said in a statement that Olivia, reportedly 15, had been with a friend during Monday night's attack on the Ariana Grande concert at Manchester Arena. The friend has undergone surgery to treat injuries from the bombing. Her mother, Charlotte Campbell, who had been appealing online for news of Olivia, wrote in a Facebook posting early Wednesday: "RIP my darling precious gorgeous girl Olivia Campbell taken far far too soon, go sing with the angels and keep smiling mummy loves you so much." Police and health officials say 22 people were killed and 119 wounded in Monday's attack. — This story corrects the high school's name to Tottington. 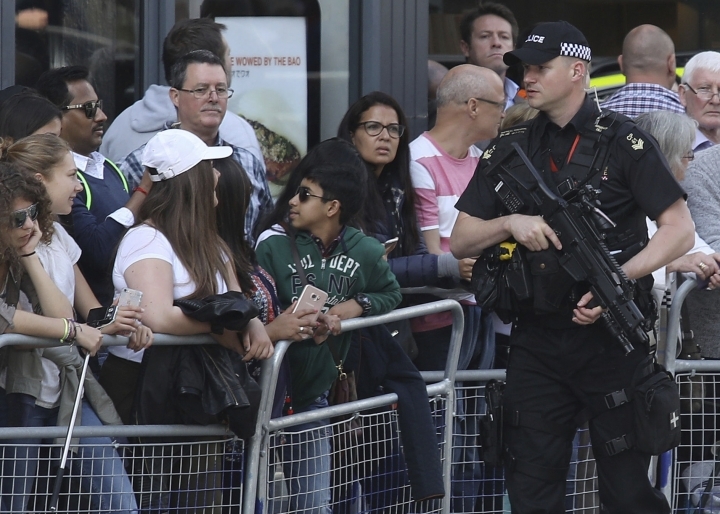 Manchester health officials have raised the number of wounded in the concert bombing, saying 119 people sought medical treatment at the city's hospitals after the suicide attack Monday night. The Greater Manchester Health and Social Care Partnership gave the higher figure on Wednesday. Jon Rouse of the agency said 64 people were still hospitalized. He said the number of overall wounded was raised due to the "walking wounded" who came in hours after the attack. Rouse said many of those hospitalized had serious wounds that would require "very long term care and support in terms of their recovery." The attack after the Ariana Grande concert also killed 22 people. Officials say no decision has been reached yet on whether to postpone planned London concerts by pop singer Ariana Grande. The American pop singer's next two concerts are scheduled for Thursday and Friday night at London's 02 Arena. Representatives of 02 Arena said Wednesday they are in contact with her promoters but haven't made a final decision. They say a decision will be made shortly. Grande's concert in Manchester on Monday night was targeted by a suicide bomber who killed 22 people and wounded 64. The singer was not injured but said later she was "broken" by the attack. The head of Britain's domestic intelligence agency has canceled his attendance at an international anti-terrorism meeting. MI5 chief Andrew Parker pulled out of the upcoming meeting in Berlin following the deadly attack on a pop concert in Manchester. 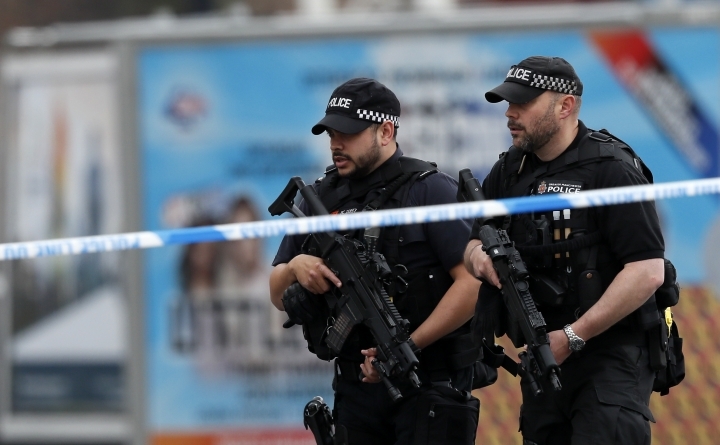 British authorities believe a suicide bomber carried out the attack that killed 22 and wounded dozens in the city in northwest England on Monday. Germany's domestic intelligence agency confirmed Parker's cancellation to The Associated Press on Wednesday. The May 29 meeting in Berlin is titled "Western democracies' responses to the threat of Islamist terrorism" and also features senior intelligence officials and experts from Europe and Israel. Parker's attendance at the meeting would have been a rare public appearance for the MI5 chief. Britain's defense ministry says the changing of the guard ceremony at Buckingham Palace has been cancelled so that police officers can be re-deployed in the wake of the Manchester concert attack. Officials also announced Wednesday that the Palace of Westminster, which houses the British Parliament in London, will be closed to all without passes. 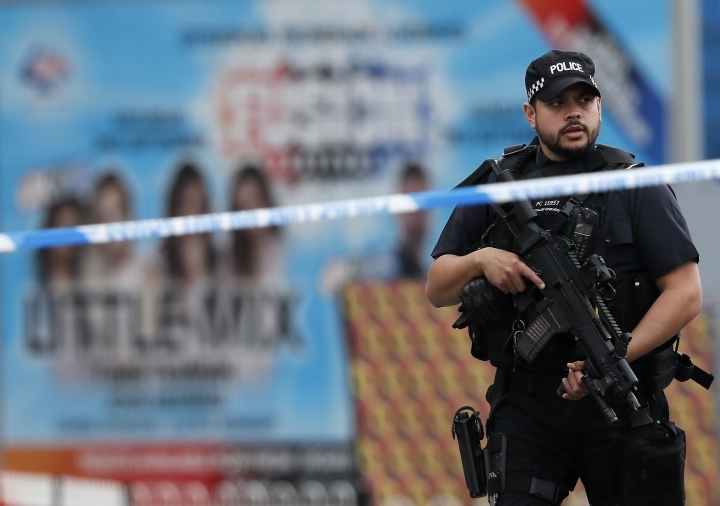 That comes after Britain's national security threat level was raised to "critical," the highest level, following Monday's attack in Manchester. All tours and events at Parliament were immediately cancelled until further notice. 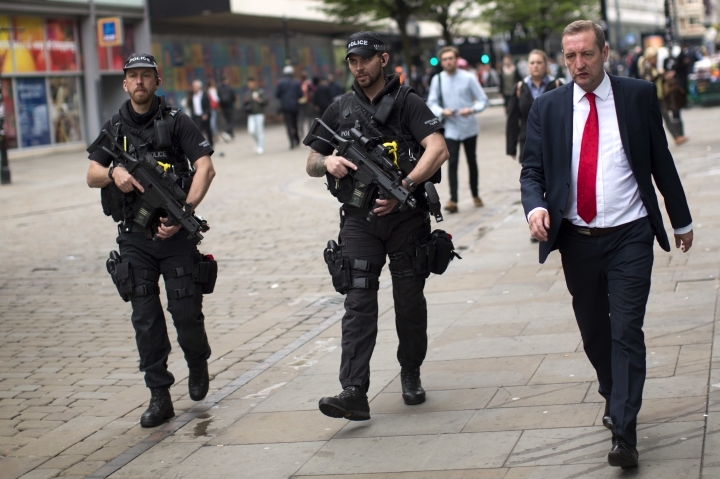 Israel's defense minister says he doubts the devastating bombing in Manchester will have any impact on European counterterrorism tactics because of the continent's "politically correct" character. Avigdor Lieberman says every bombing in Europe results in much talk, but little action. He told Israel's Army Radio Wednesday the problem is extremism among Muslim youths who are not integrated into society. He said nothing will change until these residents are ready to adopt "universal, European values." At least 22 people were killed in Monday evening's attack at an Ariana Grande concert. The bomber, Salman Abedi, was British-born and of Libyan descent. The official threat level in Britain has since been raised to its highest point. Prime Minister Theresa May is chairing a meeting of her emergency security cabinet, known as Cobra. The Downing Street meeting is dealing with intelligence reports about the investigation into Manchester suicide bomber Salman Abedi. Home Secretary Amber Rudd has criticized U.S. officials for leaking information about Abedi to the press as the investigation is unfolding. Poland's foreign minister says that a Polish couple were killed in the concert blast in Manchester. 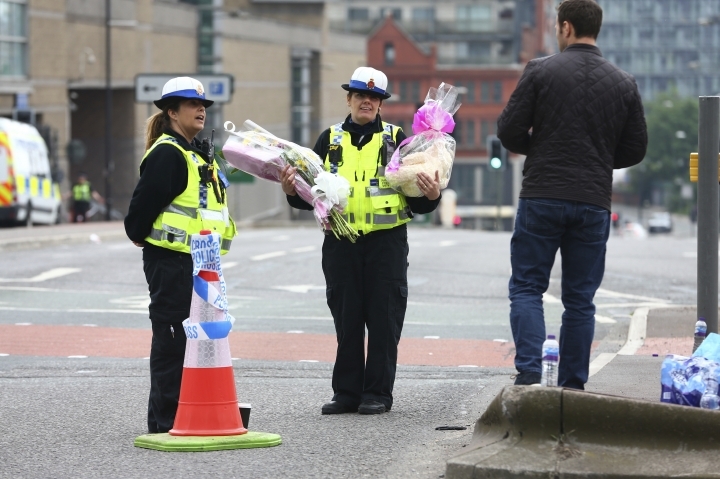 Witold Waszczykowski said Wednesday the couple came to collect their daughters from the Ariana Grande concert Monday night. The daughters were unharmed. He did not give the couple's names, but the daughter of Marcin and Angelika Klis has been publicly searching for them since the explosion. Waszczykowski also said that another Polish citizen was wounded and had undergone surgery in a hospital. Germany's interior minister has ordered that flags on federal government buildings be flown at half-staff following the attack in Manchester. Thomas de Maiziere's ministry said Wednesday that flags will be lowered to half-staff for the day on Wednesday. It described the order as "a signal of sympathy and solidarity after the cruel attack in Manchester." At least 22 people were killed in Monday evening's attack at an Ariana Grande concert. British Home Secretary Amber Rudd says Manchester suicide bomber Salman Abedi was known "up to a point" to the British intelligence services and police. 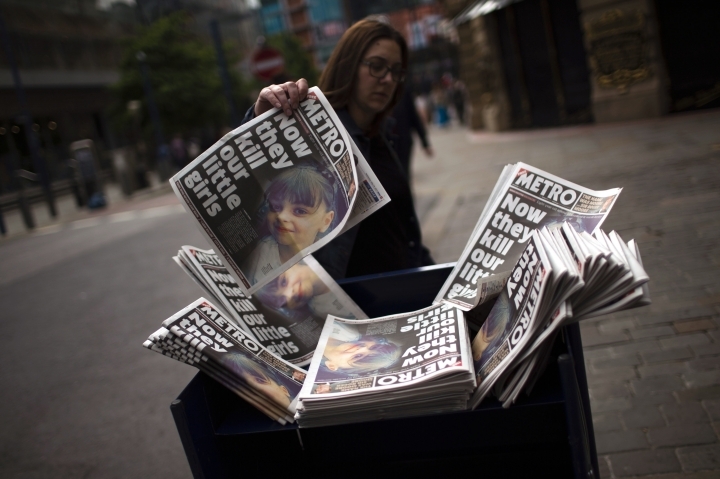 She said Wednesday the investigation is continuing and declined to provide further details about Abedi, whose improvised bomb killed 22 people at a pop concert in Manchester. France's interior minister says that the suicide bomber who targeted Manchester is believed to have traveled to Syria and had "proven" links with the Islamic State group. Gerard Collomb said on BFM television Wednesday that British and French intelligence have information that British-born attacker Salman Abedi had been to Syria. He did not provide details, and said it is unclear whether Abedi was part of a larger network of attackers. 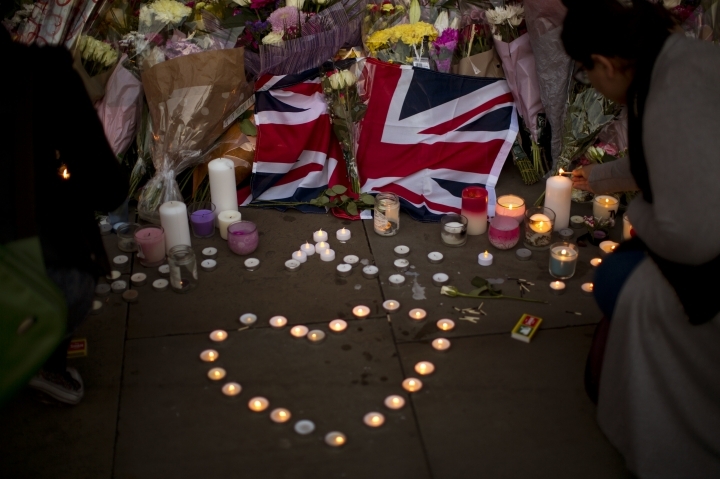 Collomb, who spoke with British Prime Minister Theresa May after the attack at an Ariana Grande concert that killed 22, said the two countries should continue cooperating closely on counterterrorism efforts despite Britain's pending exit from the European Union. With France still under a state of emergency after a string of IS attacks, French President Emmanuel Macron is holding a special security council meeting Wednesday. Britons will find armed troops at vital locations after the official threat level was raised to its highest point following a suicide bombing that killed 22. Officials say soldiers will be deployed to places like Buckingham Palace, 10 Downing Street and Parliament. They will replace armed police as Operation Temperer takes effect Wednesday. Police are trying to determine whether suicide bomber Salman Abedi acted alone when he set off his explosives at the end of a pop concert at a Manchester arena. The government Tuesday night raised the threat to "critical", its highest level, following an emergency Cabinet session.